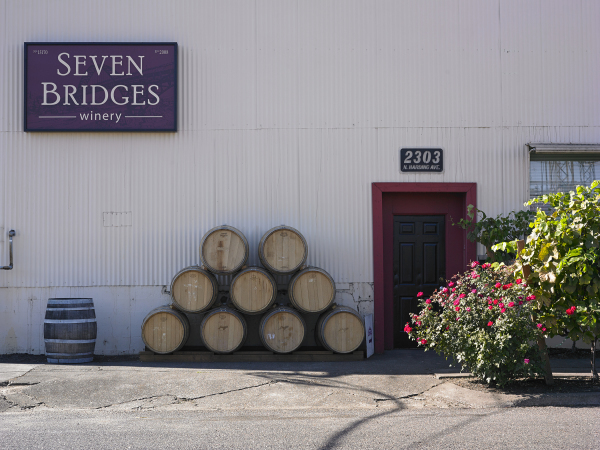 Our passion at Seven Bridges Winery is to produce top quality Bordeaux-style wines. We produce these flavor-intense red wines from fine grapes grown in Washington State and north-central Oregon. At harvest we bring the grapes to our facility in industrial northeast Portland where they begin their long journey of de-stemming, fermentation, extended maceration, long barrel aging, blending, bottling, and bottle aging. We specialize in making red blends including a Cabernet Sauvignon-based “Resolution,” a Malbec-based “Equilibrium,” and a Merlot based “Paradox”. Our premium blend “Prima Nata,” blends Cabernet Sauvignon, Merlot, Malbec, and Petit Verdot to provide a balanced and intensely flavored wine. Every year we assess countless blends to determine which will produce a premium product. We also enjoy making selective single varietal wines from some of the finest vineyards in the Columbia Valley. Our wine making process provides noticeable flavor and body while still giving the essence of the grape the opportunity to shine. Our wines have been well received by fine-wine lovers and critics alike, having recently received two 90+ ratings from Wine Spectator magazines, and top ratings from Great Northwest wines and the Seattle wine awards. Owners Kevin and Jill Ross, Bob Switzer and Jim Straus produce 2400 cases per year. At this program we will be tasting these 6 of their fine wines. At the May 8 program, you will taste 7 premium wines (1 welcome wine, and 6 program wines) along with 4 gourmet food bites. Bring 2 wine glasses for comparative tasting. This education program price is $40 and $30 for society members. Annual society membership is just $35. Pay at the door in cash, check or credit card. Check-in starts a 7:00 with welcome wine poured shortly after and program start at 7:30 ending at 9:00. Be sure to list the name of each attendee and the event you wish to attend. You can also call Steve and Katherine Shelton at 360-696-4498 to make reservations. ​Not yet a CWES member? Click here to join us!